How to keep a shirt tucked in? I’m able to see what searches lead people to my blog. One of the recent ones was, “keep a shirt tucked in”. Really? All of my exciting things that I can/could talk about and a shirt is what brings your here. Okay, great! Let’s work with that…. 1) The shirt can be too short or too small. If it is too small, it will have a tendency to ride up, making it too short. 2) Your pants are too big – nothing to hold it in the pants. 1) Wear a shirt that fits appropriately. A well fitting shirt has enough material to keep your shirt tucked. 2) If your pants are too big, wear a better fitting pair of pants or a belt. 3) If your pants have too low of a ride, (you’re not trying to “sag” your pants & wear a tucked in shirt, right??) you may need to wear a mid-rise or an at waist pant. 4) Barefoot Runner is currently in the Army, when he has to wear dress uniforms, he wears “shirt-stays”. Now, if you’re not familiar with shirt-stays, I’ll try to describe them to you. They are basically a set of suspenders that attach to the bottom of your shirt that attach to your socks. Not only will your shirt stay tucked, but your socks will stay up! BONUS! There is a certain sexiness about him when he wears them. I’m not sure if it is the whole garter look that he has going, or the fact that I know he will look polished and put together for the event. 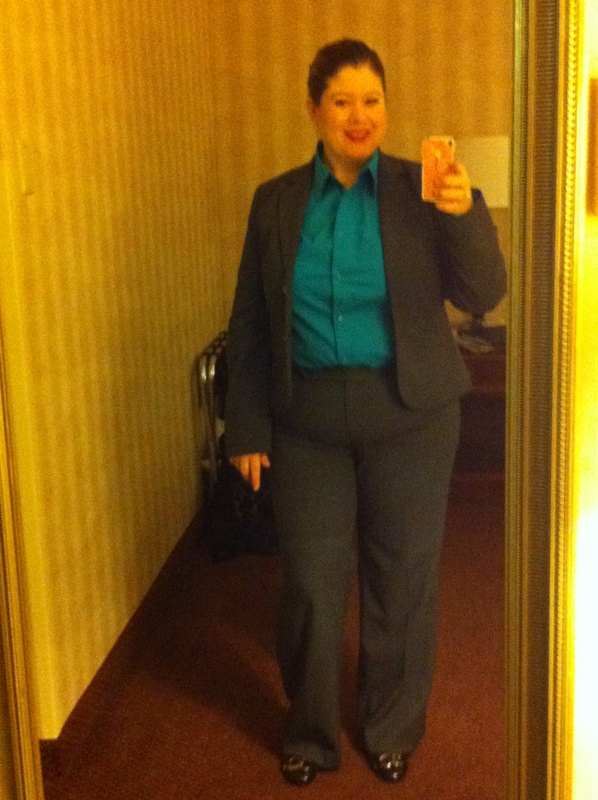 See shirt tucked… not my favorite look, but sometimes you just have to do it. Now, I have on occasion have to wear my shirt tucked, but I try my best to wear outfits that don’t require it. When I have to look like “a suit”, I might sport the occasional shirt tuck. I think it is perfectly fine to not wear a shirt tucked in everyday as long as you don’t look sloppy.